This winter has been crazy! I don't know if we should be wearing raincoats and rain boots or ski jackets and snow shoes. Every day brings a new weather report and each day is different, snow today, gone tomorrow. Along with this unpredictable weather comes unpredictable driving. Rain makes the roads slick and snow, well, snow is just snow. I hate the first day that snow hits Cleveland because everybody forgets how to drive. Since, snow has been unusually absent this year, it seems that with each new snowfall this winter, people act as if it was the first snow of the year. We live in Cleveland people! It snows, a lot, and somehow the ability to slow down, clean our cars off and respect each other goes right out the window. It is not just snow either but rain, too! As a mom I am mortified! Okay, not really mortified but since you can't hear my mom voice I thought I would try and show you instead. I am mortified! 1. Brush the snow off your car! This is not hard people! A two inch by two inch opening is not big enough for anybody to see through especially when trying to navigate in a snow storm. When roads are wet from snow or sleet, slow yourself. Repeat this as necessary. Even if the streets are dry - slow down! 3. Share the road, but not too close. Share the road means that we all get to drive on it, not on top of each other. Back off my bumper in any kind of weather but when the roads are less then ideal quick stops can be disastrous if drivers are on each other’s tails. Keep a safe distance, at least a car length, between you and the other car. 4. Headlights are not just flashy bling for your car - they have a purpose. Your headlights have a purpose and not enough people use them at dusk, blizzards or dark and rainy days. How are you suppose to see other cars or for them to see you if we don’t light up the road? Turn your lights on whenever it is dark out, even if it is noon. 5. Pack an emergency kit. Your car emergency kit should include a blanket (or blankets), snacks, jumper cables (or if you are lucky one of those battery boosters that don’t rely on another car) and a flashlight. I would also add cards and crayons only because if you are stuck in traffic with kids, having something to keep them busy is key. Worse case scenario - you might be stranded and no power to run the in car entertainment system. Best case scenario you are prepared for some quality time. Don’t stress. 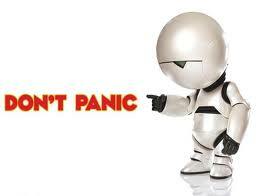 In the words of the The Hitchhiker's Guide to the Galaxy - Don’t Panic! And, be safe, especially when the roads are covered with snow and ice. Accidents will happen but with a little luck and some safe driving it, hopefully won’t be your fault. I wrote this blog post while participating in the SocialMoms and Esurance blogging program for 8,000 My SocialMoms Rewards Points. For more information on how you can participate, click here.